For an extended vacation away from home, nothing beats staying in a vacation rental at the beach. 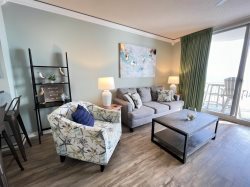 Whether you are a couple, have children or are traveling with a large group; our Navarre Beach vacation rentals provide the space you need to be comfortable and usually are more reasonably priced than hotels for extended visits of three nights or more. If you've never stayed in a vacation rental before, you likely have all sort of questions. See below for information to help you get ready for your trip to Navarre Beach. Contact our office with additional questions not answered below. What's included with my Vacation Rental? What should I bring on my Navarre Beach vacation? Where is the nearest Navarre grocery store? Navarre Beach is along the Florida Gulf Coast, between Pensacola Beach and Okaloosa Island. The area is only a ten-minute drive from downtown Navarre. Visit our Area Map & Directions page for more information on getting here. What is there to do in Navarre Florida? The Navarre Beach area has many activities and things to do for your family to enjoy. Indulge in water sports, hiking, canoeing, shopping, aviation history, golf, fishing or just stroll on our white sand beaches overlooking the emerald green waters of the Gulf of Mexico. The Navarre area also offers a wide variety of restaurants that suit any taste or budget. Visit our Local Area Guide for more information on what to do in Navarre Beach. What's the weather in Navarre Florida? The warm season in Navarre is May through September. Summers in Navarre are warm, with an average high of 84 degrees. The cool season is usually from December through March, with an average high of around 65 degrees. Visit our Weather page for more information on Navarre Beach weather and when to visit. Is Navarre Beach pet friendly? Unfortunately, Santa Rosa County (Navarre Beach) does not allow pets on the beach. Not to worry! Pensacola Beach has two dog parks that are open twice per day and is only a short scenic-drive away. Planning to bring your furry friend on your Navarre Beach vacation? Browse our Pet Friendly Navarre Vacation Rentals to find the perfect rental for you and your pet. The Navarre Beach is controlled by a series of 99-year leases, instead of private owners. The local beaches of Pensacola and Navarre are owned by the public rather than private investors. Because of this, waterfront access along both Pensacola and Navarre beaches is largely unrestricted. Unlike many other beaches, the beaches to not have any gates. How far is Navarre Beach from Destin, FL? Navarre Beach is about 24 miles from Destin, FL. The drive only takes about 30 minutes. Visit our Directions Page for driving directions from Destin to Navarre Beach. How far is Navarre Beach from Pensacola, FL?? Navarre Beach is about 26 miles from Pensacola, FL. The drive only takes less than 40 minutes. Visit our Directions Page for driving directions from Pensacola to Navarre Beach. How much is the Navarre Beach toll bridge? The Bob Sikes Bridge, also called the Navarre Beach toll bridge, is $1 per use, with the exception of a one-time fee of $2.50 for your first time onto the island if you do not have a Sunpass. For $5 you can purchase a Sunpass Mini for your vehicle if you plan on returning frequently. Where is there to snorkel in Navarre Beach? Navarre Beach has a variety of reefs near the shore that allow beginners and experts to both view the stunning reef ecosystems and marine life. The East Sound Side Reef, one of the smaller reefs, is located Northwest of Sandpiper Pavilion. The West Sound Side Reef is one of the larger reefs and is almost 300’ long and 100’ wide! The Gulf Side Reef is on the Gulf of Mexico, about 2,000’ East of the fishing pier, South of the Sea Oat pavilion. Visit our Water Sports & Snorkeling page for more information on Navarre Beach snorkeling. Where can I find shells on Navarre beach? Navarre Beach is known for their large assortment of beautiful shells. The Gulf of Mexico brings many shells to the Navarre Beach shore including the Coquina Clam, Giant Cockle, Scotch Bonnet, Shark Eye, Scallop, Tulip Shell and more. Wander along the Navarre Beach and you should be able to find shells almost anywhere! What time zone is Navarre Florida in? Navarre Florida is in the Central Standard time zone (GMT-6).